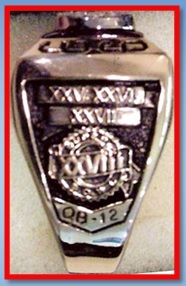 The jewel for 4th AFC Championship ….after beating Kansas City with Joe Montana, Marcus Allen, Neil Smith, and the late Derrick Thomas 30-13 to make it to Super Bowl XXVIII. 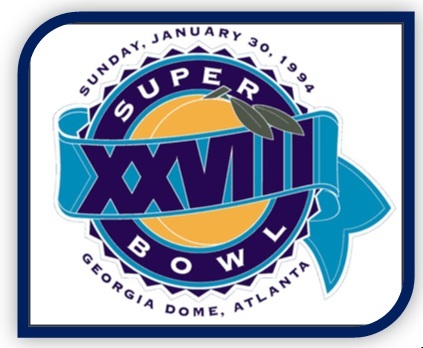 I remember they asked Stephen Hawking right before Super Bowl XXVIII to calculate how long would it be for a team to make it to 4 Super Bowls in a row again. He gave his explanation with the current (then) landscape of 28 teams and projected free agency, it wouldn’t happen again for another 46 years. I wonder how that number is skewed now with 32 teams with the advent of the Texans, Ravens, Jaguars, and Panthers. Still its a feat to be celebrated. 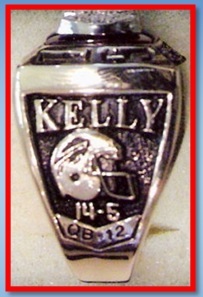 I wish we would have brought home the BIG ring but my boyz were still a team to be lauded for their resilient effort. Isn’t that the essence of sports and life? 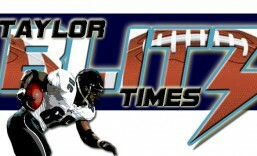 Once you get knocked down get back up and go after it again…that’s the axiom! Of course you’d like to win but its your effort that’s celebrated. One final look back takes us to Jim Kelly’s debut back in 1986. His inspiring fans to think of a brighter future for long suffering Bills fans. In a strange way its because MY Buffalo Bills kept getting up and going after it is why I remember them with such reverence even more so had they just gone to 1 and won it. 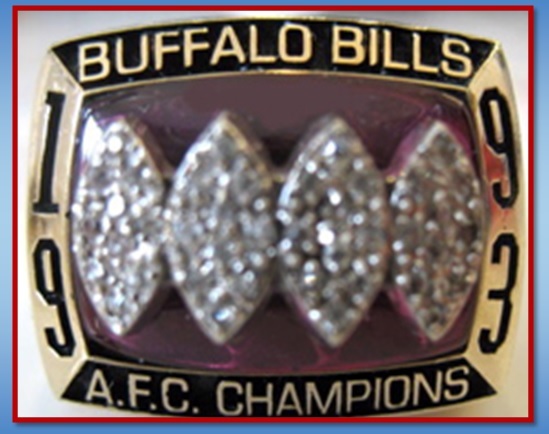 This entry was posted in Ring of Champions and tagged 1993 Buffalo Bills, AFC Championship ring, Buffalo Bills, Conference championship ring, Jim Kelly, Super Bowl XXVIII, Thurman Thomas. Bookmark the permalink.